A March 2015 Harvard Business Review article on strategy execution noted that more than 80% of professional organizations surveyed have considered at least one formal management system (cross-functional committees, service-level agreements, centralized project-management offices). Only 20% believed such systems were actually effective. Why the disconnect? Obviously, the need to design and implement the right business model is critical. Your business model outlines how you will solve—in a unique way—a problem for your customer. It seems straightforward, but there’s a lot involved when designing a business model that will empower you to succeed. And implementation must also be executed with just as much care. 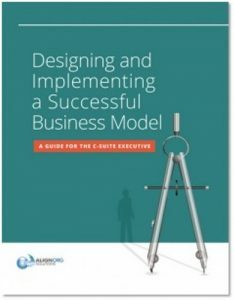 Our complimentary guide, Designing and Implementing a Successful Business Model: A Guide for the C-Suite Executive, helps leaders select and implement the right business model. It highlights key organization design elements and why alignment is important to this process. determine whether working with an outside firm would be your best option. Watch your inbox for an email from us. Once you confirm your email, we'll send you the copy of your Executive Guide. Thank you!